....on foreign policy, calls him worse than Bush. Yes, worse than George W. Bush. "The foreign policy that John McCain now advocates is reckless and promiscuously interventionist. 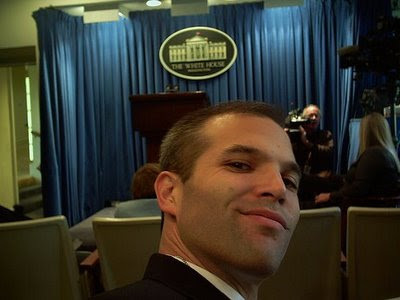 If he were a university student majoring in international relations or security studies, he would deserve a resounding F for his analysis of the crucial issues that the United States has confronted over the past 14 or 15 years. After a promising start, his performance has steadily deteriorated. The last thing that America needs is an even more aggressive and incompetent steward of foreign policy than George W. Bush has been." 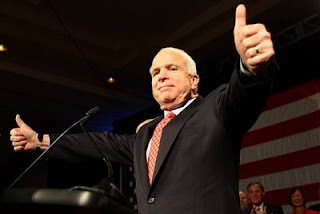 Click through to read the article, it's pretty in depth and follows McCain's increasingly hawkish stance since he came to Congress in the early 80's. Suspicions about Sen. Obama's true motives have been building over the past few weeks, but not until today have the bloggers called him out for betraying the Democratic Party's losing tradition. "Barack Obama seems to be making a very calculated attempt to win over 270 electoral votes," wrote liberal blogger Carol Foyler at LibDemWatch.com, a blog read by a half-dozen other liberal bloggers. "He must be stopped." "Increasingly, Barack Obama's message is becoming more accessible, appealing, and yes, potentially successful," he wrote. "Any Democrat who voted for Dukakis, Mondale or Kerry should regard this as a betrayal." Democratic National Committee chairman Howard Dean said that he was "sympathetic" to the concerns of bloggers who worry that their nominee seems stubbornly bent on winning the election, but he warned them that the DNC's "hands are tied." "If Sen. Obama is really determined to win, I don't think any of us can talk him out of it," Mr. Dean said. Liberal bloggers said that they would be watching Sen. Obama's vice-presidential selection process "very closely" for signs that he is plotting to win the election. "Barack Obama still has a chance to pick someone disastrous as a sign that he wants to lose this thing," Ms. Foyler wrote. "If not, he should brace himself for some really mean blog posts." Andy has some of the best fake news around, check out his site. "... McCain's entire career has been dedicated to the idea that America must always have the right to solve its problems by force. Throughout his political career, he has argued for increased use of force in virtually every military engagement the U.S. has been involved in since Vietnam. He complained about Bill Clinton's "excessively restricted air campaign" in Kosovo, campaigning strenuously for a ground invasion. During the 1994 flap over Pyongyang's nuclear program, he called for "more forceful, coercive action." Even before the latest Iraq War, McCain argued way back in 1999 that the only way to deal with Saddam Hussein was "to strike disproportionate to the provocation." The most frightening example of McCain's fondness for force is on display in his own book, Faith of My Fathers, when he complains about the politicians who refused to allow pilots like him to attack, say, Soviet ships unloading arms in Vietnamese port cities. "We thought our civilian commanders were complete idiots," he writes. Bombing Soviet ships, of course, would probably have started World War III, but McCain's vision, then and now, encompasses war as a way of life. There is significant evidence that McCain believes war is something righteous and necessary, a tonic for the national soul, intrinsically "noble" irrespective of context (he is still one of the only politicians to apply that word to the Iraq conflict). That is why it's no joke when McCain says casually, "There's gonna be other wars," or when he sings, "Bomb bomb bomb, bomb bomb Iran." We have to assume that he will jump at the chance to expand this conflict and hit those politically sensitive targets his "complete idiot" civilian commanders once barred him from going after in Vietnam." 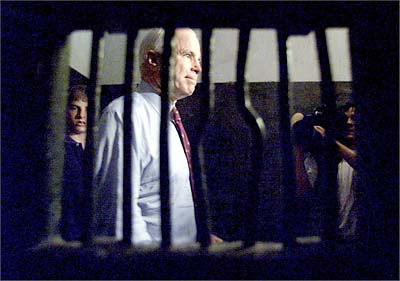 Has there ever been a war McCain wanted to end? Seems to me he wants American troops in every country across the globe. Hey, we're most of the way (70%!) there! "For the first time in U.S. history, more than one in every 100 adults are in jail or prison, according to a new report documenting America’s rank as the world’s No. 1 incarcerator. It urges states to curtail corrections spending by placing fewer low-risk offenders behind bars. Using state-by-state data, the report says 2,319,258 Americans were in jail or prison at the start of 2008 - one in 99.1 adults. Whether per capita or in raw numbers, it’s more than any other nation." "The most pertinent issue is not what McCain did or didn’t do during the war in Vietnam, but what he learned from that searing, incredibly bloody and wholly unnecessary failure of U.S. policy. Clearly he learned that torture is morally wrong, illegal and counterproductive, and he has spoken with great moral authority on that issue. But listening to him now and over the past decade or so, he also seems not to have learned why that war itself was a tragic mistake — and why we needed to leave Vietnam long before we did. Consider this next time McCain says he wants us to stay in Iraq for an undetermined length of time. If McCain had been in Nixon's shoes, we might still be fighting in Vietnam. And he would think that was a good thing. The choice is clear, folks. When I initiated a discussion with my coworkers this afternoon of this sick collaboration between G.W. Bush and Congressional heavyweights, including the Democrats we elected on the basis of their promises to end our wars, not extend them, my liberal friend said, “So?” “Are you surprised? What’s the big deal? This is what we do; it’s what we’ve always done.” And true, too, of course, but never before in our history has the citizen, the voter, had the opportunity to discover so readily and clearly what terrible, illegal, immoral things are perpetrated in his or her name. We must not, I perhaps somewhat heatedly replied, relinquish our ability to be disgusted and outraged; we must not accept such foul business, such a sellout of our decency as “the way things are.” It is our duty to read such articles and commentary as Mr. Hersh and The New Yorker can supply, to disseminate such revelations, to provoke our neighbors and friends and family. This is why I blog. It's rarely OK to bring up such subjects in polite company, but I say we must. I can't always say these things out loud to people I come across everyday, so I put it here. I try to highlight stories that don't get enough attention. But whatever I do with this blog, it's because I believe it is Patriotic to speak up about America, and even better to point out problems so we can get to the solutions. ...this morning as Tim Russert interviews Jesse Helms and George Carlin.